Staff Photo by Patrick Smith<br> Brushy Mountain Correctional Complex prisoner James Slagle talks about serving his 318-year prison sentence on Friday. 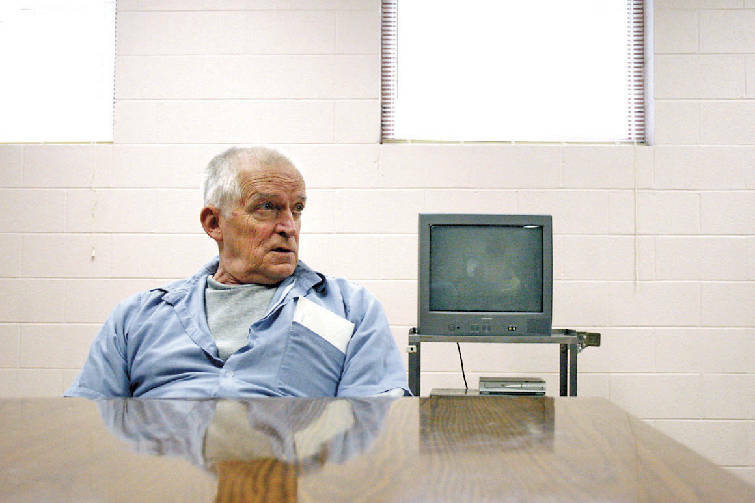 Mr. Slagle has served 41-years in the Tennessee Correctional system. The complex should be fully decommissioned in June, with most of the staff moving to the new Morgan County Correctional Complex. PETROS, Tenn. - The Castle sits in the nook of peaceful hills deep in Morgan County. The pale concrete and limestone stand in stark contrast to the damp greens and browns of the trees and fields nearby. The first building was wooden, surrounded by a fence its occupants built by felling trees and hauling timber from nearby hillsides. Decades later inmates quarried limestone to build a new building that kept them inside. In a few months Warden Jim Worthington and the staff will close the doors of the 113-year-old Brushy Mountain Correctional Complex and walk away from the prison many in the corrections department call "the end of the line." "No one ever thought Brushy Mountain would close. Some of the staff still think we won't close," Mr. Worthington said. "But it's here, it's a reality now ... we're closing." Most of the staff and inmates will move to the newly expanded Morgan County Correctional Complex about 10 miles away. Morgan County completed a $182 million expansion, which added more than 1,400 beds. The cost of operating the old buildings and no room to expand put Brushy Mountain on the chopping block, the warden said. But for many staff members and some inmates, the new prison can't replace Brushy. "My family's property backs up to the prison," said Sue Young, secretary to Mr. Worthington. She and other Morgan County residents view the prison as permanent as the mountains that run through their county. Ms. Young remembers hearing the prison's steam whistle blow each day at noon. That was the only time someone wanted to hear it. The whistle also was used to announce an escape. It would blow once to announce the alarm and then once each time for how many prisoners had fled. On June 10, 1977, the whistle blew seven times. That was the day Martin Luther King Jr. assassin James Earl Ray clambered over a fence in the back corner of the prison with six other inmates. Mr. Ray made it less than three miles from the prison in the steep hills and thick woods. He was captured by prison guards less than two days after the break. Prisoner hands built the original structure and surrounding walls of Brushy Mountain State Penitentiary in 1896. The Coal Creek War birthed what would become an internationally recognized prison. Coal miners in Anderson County fought with the Tennessee Militia over the state's continued use of convict labor in coal mines and on railroads. Prisoners lived in labor camps near mines and job sites throughout the state and often were used in place of miners desperately seeking work, said Debbie Williams, classification coordinator and caretaker of the Brushy Mountain museum. "I've often wondered what went through their minds, having to build their own prison," Ms. Williams said during a tour of the one-room museum. Ms. Williams and other staff members gathered relics from the prison's history for the prison's 100-year anniversary in 1996. Her father and grandfather worked at the prison. She has been at Brushy Mountain for nearly 29 years. The wooden structure and fence built by the prisoners deteriorated over the ensuing decades and by the 1920s Brushy was called one of the most "deplorable" prisons in the country, Ms. Willliams said. The Tennessee General Assembly raised money to build a new prison, and the inmates quarried limestone and other materials were brought in to construct the current castlelike building. Seen from above the prison is cross-shaped, which is no accident, Ms. Williams said. Prisons were called penitentiaries because the mission of a prison was to help wayward inmates serving penance. The pastor was the No. 2 person in charge of the prison. Sgt. David Bunch, a guard since 1995, grew up one mile from the prison. His father and grandfather retired as guards at Brushy. He said that when the whistle blew announcing an escape, nearly all the men in the area would grab their shotguns and join the manhunt. Ms. Williams said the only doctor in the area was the prison physician. The doctor often delivered residents' babies at Brushy Mountain. Men would play baseball games against the inmates on Sundays after church services while women and children picnicked on the hills above, watching, she said. Black-and-white photos of an injured deer named Jeronimo hang on the walls of the museum. The deer lived within the walls of the prison as a kind of adopted pet and often stole food from inmates' cells, Ms. Williams said. Gov. Winfield Dunn shut down Brushy Mountain in 1972 after guards went on strike over unsafe working conditions. "Those were hard times," Sgt. Bunch said. Though only a child at the time, Sgt. Bunch remembers picketing in Nashville with his family. "My sign said, 'Who will pay for my milk and diapers?'" he said. The prison reopened in 1976. It served as a maximum-security prison for most of its existence, but in the 1980s its mission turned to classification. All East Tennessee prisoners go through Brushy Mountain to be classified to the level of security in which they'll be housed. Those duties will now fall to officoals at the Morgan County prison. Cpl. Adrian Hamby started at Brushy Mountain three years ago and now works at Morgan County. He remembered his fear the first day on the job. "When they slammed that door behind me, I was scared to death," he recalled. Though he's known Brushy all his life, he said the move to the newer facilities will be good. "It's just the people that make it; it isn't the building," he said.